A novel technique for interpreting MRI scan data produces images of the brain’s nerve network that can guide neurosurgeons to preserve critical brain functions such as vision, speech and memory. 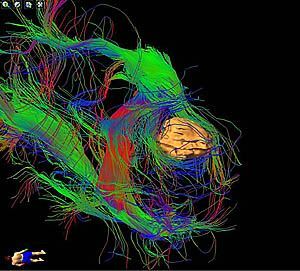 The technique, called tractography or diffusion tensor imaging (DTI), has been used by University of California San Diego Health System neurosurgeons to guide brain tumour surgery. Tractography scans, which map the oriented water molecules in nerve fibres, can reveal tiny open paths between the nerve fibres to reach brain tumours. The scans display the neural network in multiple colours. Other current imaging techniques such as computed tomography (CT) and conventional magnetic resonance imaging (MRI) cannot achieve this type of visual display. Anthony Chetti is one of the beneficiaries of tractography-guided brain surgery. Chetti developed a tumour in the region of the brain called the occipital lobe, the portion of the brain responsible for processing visual information. He underwent a complete excision of the brain tumour without any damage to his vision. “Anytime that you are told that you can potentially lose your vision, you are scared,” said Chetti, a San Diego school teacher. “But when Dr. Chen shared the tractography images with me and showed me how he was going to avoid injury to the connection between my eye and the occipital lobe, I was reassured. When I woke up from surgery, I asked for my glasses immediately and began running systems checks. I could see the clock. I could read the words on a sign. It was immediately evident that there were no problems."